Deer Horns were historical civilized weapons of Chinese, which were easy to conceal beneath period clothing and were used in a pair usually. There was a style where the upper blade and the lower blade were made of the same length. 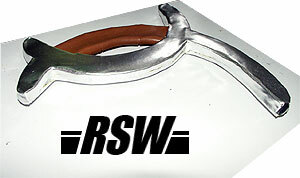 However, this RSW we made was modeled after an actual piece where the upper blade was longer than the lower one. We had also made the size, weight and balance very accurately. 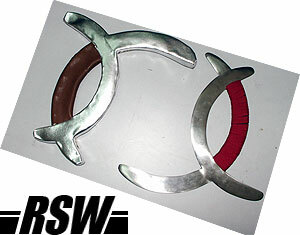 The deer horn with the red grip in the right hand side picture was the actual piece that the customer provided us to model our version after. 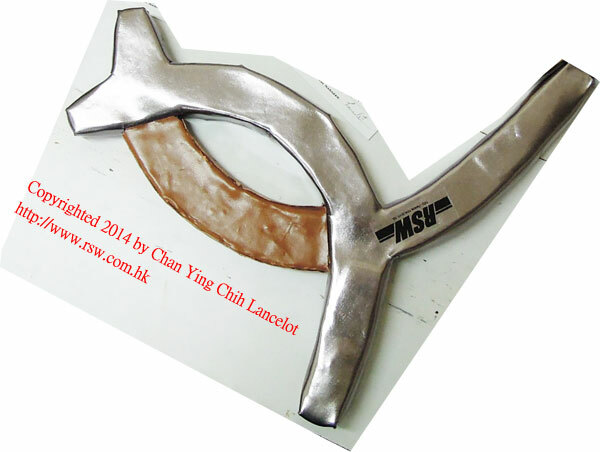 We'll repair the battle damage of your blade for 415 HKD. If you want the guard renewed also, it would be 415 HKD. The repair service excludes broken core. For international order, we accept payment through PayPal. Please email for details. Disclaimer: By placing an order, the buyer represents that the products ordered will be used in a lawful manner. Lancelot Chan Ying Chih will not be held liable for the misuse of any product purchased from us or any of our distributors & dealers. You agree to indemnify and hold harmless either the company, its owners, investors, board members, and staff against any and all claims, demands, actions, or proceedings, resulting in injury, death or damages, losses, and/or liabilities, costs and expenses, including attorney fees, relating to or arising out of any claim asserted by you against the aforementioned companies.